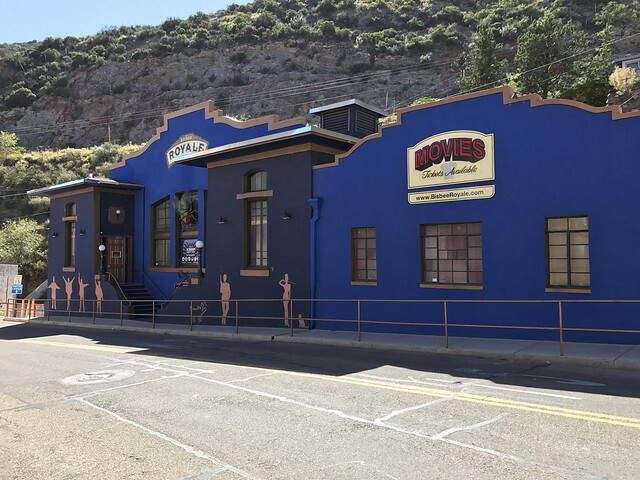 Description: The artifact is a theater venue, inside the Bisbee Royale Theatre. While that venue is currently closed off from public access, the rest of the theater's venues are operational and opened to the public. We currently are not sure what causes this aberration's effects to manifest, it seems to respond to groups of at least three people who are attentively watching. Larger crowds tend to trigger the artifact's effect quicker. Background: In the late 90's, there were rumors of a mysterious theater inside an old church. The church stands in the Royale district of Bisbee, though locals have no recollection of any theater ever being built inside. Local youths would break into the theater late at night and report seeing "strange foreign films." This eventually caught the attention of the Diamondback Outfit who at the time were hunting elements of the paranormal black market in Cochise County. The Diamondback outfit procured the deed to the old church and then renovated the property. A functional theater was then opened in 2012. They have since rented out spaces within the property to a local radio station as well as local small businesses. In other news, another ten thousand personnel from the Wayward Society have volunteered and been integrated into the United States Army, where they will assume officer roles in our fight against the Paranormal. So far members of the elite Wayward Society have mostly been operating independently, previously performing humanitarian operations such as evacuating remaining Canadian citizens to the safety of the United States. They had previously worked with Canadian resistance cells in an attempt to fight back against the Sasquatch menace. Reports show that the last vestiges of human resistance north of the border have collapsed. It is unknown if there is a surviving human presence in what was formerly Canada. The scene cuts to a field reporter standing in front of the camera holding a microphone. Behind him soldiers can be seen setting up field fortifications and artillery positions. Several pieces of artillery near the reporter fire in quick succession, causing the reporter to flinch. -by tomorrow morning! Plans to firebomb the wilderness north of Arlington are being discussed. Its an ugly wilderness, a Sasquatch wilderness! The audience present at the venue gives a standing ovation and the event is deemed a success. On August 7th, 2018, Diamondback members 3,5,6, and 11 had decided to trigger a paranormal event during their recreational time. Lights dim, the venue proceeds with the movie airing: the film's title card shows that this film is a Wayward Society research expedition, dated July 2018. The scene opens with some minor activity before focusing on a freshly dug hole with a shovel stuck in the ground nearby. The individual holding the camera (henceforth referred to as Turtle-2) speaks. The camera focuses on another individual (henceforth referred to as Turtle-1) who quickly shows disdain at being recorded, before turning towards the tunnel entrance. Turtles 1 and 2 enter the tunnel, not too long after entering the camera switches to low light recording. The scene briefly opens up to show a large conclave chamber with several bats roosting on the ceiling. The camera lowers to show a rocky outcropping jutting out, where Turtles 1 and 2 assume position. Rustling and clicking can be heard as Turtle 2 produces a handgun off-camera. The camera lowers to ground level as Turtle 2 complies, before a very large snake-like aberration comes into view. Turtle-1: Look at him. Isn't he beautiful? Incorporeal. Look. The camera zooms in to show the large aberration coiled around a pillar above a pool of water. A bat passes through the aberration causing its body to appear slightly transparent. Turtle 1 moves to clasp a hand over Turtle 2's mouth. The camera pans to show Turtle 1 with a finger raised to their mouth, giving the "shush" gesture. The Camera then pans to get a view of the aberration, which has just gored a bat. The aberration begins to tightens its grip around the pillar, causing a loud rattling noise. The aberration is now staring directly at the camera, flaring its ears and baring its teeth. Turtle 2 can be heard hyperventilating behind the camera, appearing to be attempting to backtrack out of the tunnel. Turtle 1's hand briefly appears in the shot before rustling is heard as it seems the two Warders begin wrestling. A loud bang is then heard, as the hand gun goes off. The camera ceases its movement and all noise coming from the two warders dissipates. The camera slowly pans over to the ledge. A rattling sound similar to the one heard previously can be heard. Slowly, the Ganesha's figure can be seen emerging over the ledge. The camera shakes, pans up, and spins around to face the way in which the two warders entered the cave. The camera shakes as Turtle-2 begins to sprint towards the cave. Gunshots can be heard in the background as well as the crunching of rocks and large splashes. Turtle-2 trips and hits the ground with a thud, dropping the camera in the process. The camera now points down the tunnel from which Turtle-2 came. Still in low light mode, the camera show's a massive figure rising behind Turtle-2. Turtle-2 briefly looks over her shoulder before hastily turning back to the camera and picking it up. Turtle-2 rises and continues to sprint towards the cave exit. Several loud thrashes can be heard before the camera is launched into the air. As the camera spins it shows Turtle-2 with their arm still out stretched from the throw, before landing outside of the cave. A muffled scream can be heard along with the sounds of thrashing and crashing rocks. The footage continues for another seventeen minutes before the showing ends. Upon completion of the viewing, the participating Diamondback members reported the incident to the head of Diamondback outfit. Upon contacting the DCC, Diamondback 1 learned that the DCC records do not correlate with what was shown in the theater. A further followup with Turtle outfit led to a very quaint discussion between Diamondback 1 and Turtles 1 and 2. There's no way that was special effects. There's no rhyme or reason. Hopefully this puts to rest other Warders' doubts about the nature of these films.